If you’re concerned about your board’s diversity, you’re not alone. The foundation Leading with Intent surveyed leaders from 1750 nonprofit organizations, and found 65% of CEOs and 41% of board members reported being somewhat or extremely dissatisfied with their board’s racial and ethnic diversity. And this isn’t a new problem. In fact, boards have not become any more diverse within the past two years — and this won’t change without significant shifts in both strategy and execution. That’s because many organizations don’t realize why board diversity is important, or might just not see it as a priority — as evidenced by the same survey, which found that only 20% considered it a top priority to actually work on the issue of board diversity. But if you’re reading this post, that probably means you want to change this — and you’ve come to the right place. Is this something that will change overnight? No. However, there are many things your organization can do to combat prejudice and start thinking more about inclusivity. 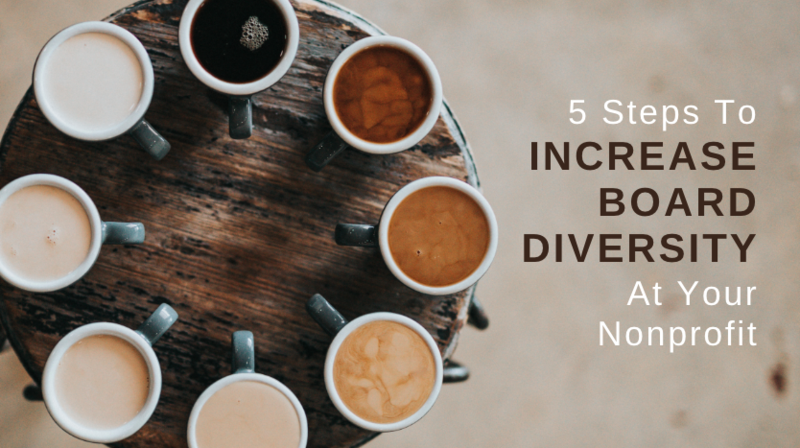 Below, I’ve listed the five steps you can take if you want to start building a more diverse board. For each step, I’ve also added an action item you can take today. 1. Address what lies under the surface. Bias is ugly. It’s real. And it needs to be named to be changed. Unconscious bias can shape all aspects of the hiring and recruiting process, from the way openings at your organization are posted to the experience employees or board members have once they’re selected. It also affects the way interviewers evaluate candidates and who is ultimately hired, as well as shaping the organizational climate. This will either allow all types of people to participate comfortably or force them to leave. To get an inside perspective on this issue, I spoke with Lauren, the director of a professional association helping teachers and other educational leaders to improve special education programs. “Ensuring diversity has always been a priority for our organization, but it can definitely be challenging because the teaching field is largely female and in our particular region, predominantly white,” she said. And while race and gender are the most evident forms of diversity, they aren’t the only dimensions you need to consider. A person’s age, nationality, sexual orientation, educational and professional background, level of ability, and socio-economic status can all shape their contributions to your board — and examining your assumption has around them can lead to the discovery of biases you didn’t know existed. “We get a lot of interest and engagement from retired teachers who have more time to participate, but I always want to make sure we aren’t just building an echo chamber here,” she continued. For example, some nonprofits may cite the perceived lack of fundraising power of younger applicants or applicants of colour when considering other candidates — but questioning why those two things are considered mutually exclusive should also be an important part of the conversation. No one, and no organization, is perfect. However, checking your privilege, whatever form it comes in, is one of the first steps. This means thinking honestly about how your background shapes your current beliefs, and how you benefit from dominant ways of thinking in society — whether it’s as a white person, a straight person, or any of the other many intersections of inequality in society. Run a diversity audit to see how your entire organization, not just your board, stacks up. First, look at the demographic of your board. Then, look at the demographic of your community. Are there any groups that are underrepresented? How does your board (and your organization as a whole) compare to your community? If the two are vastly divergent, it might be time to rethink your recruiting — and ask yourself why there’s such a gap. Fostering diversity takes sustained and intentional action. At Lauren’s association, everyone from the board chair to the office assistant knows that recruiting all different types of people is an organizational priority. Creating an aligned vision will help ensure that all board members are taking steps to invite diverse people from their different networks to join the team. Asking your team and existing board for help also reflects that this isn’t just a one-time effort, but a sustained part of your organization’s mission going forward. However, increasing diversity within your team can be an uphill battle if you’re initially the lone voice bringing it up — or the only one who thinks it’s important. However, you might find that once you start speaking up, other people who didn’t feel comfortable bringing it up join in and support you. Diversity training within your organization can also help you gain support. Making resources available (such as this style guide for inclusive language) or having workshops with your team to train them on equitable practices is a good step to make sure the space you’re creating is truly inclusive. At your next board or team meeting, take this unconscious bias inventory to begin unearthing assumptions that may be holding you back. Opening the conversation in a non-confrontational way, and showing that everyone has biases they need to overcome, will help you be more effective in the ongoing quest for equity. Want to do more? Check out this webinar, Moving From Talk to Action on Diversity & Inclusion, from Elizabeth Engel and Sherry Marts, authors of Include Is a Verb. If you want to build a more diverse board, just accepting referrals from current board members or those already connected with the organization isn’t the best way to do it. People tend to know people similar to them, and if you’re already finding your board is too homogenous, you’ll just be adding more of the same. Post online on websites like idealist.org or createthegood.org, and take advantage of LinkedIn’s targeting options. Blast your social media accounts with the open position, and ask your employees and members to share it too. Ask local organizations or associations who work with the communities you want to recruit for assistance. Identify events that attract the type of people you’re looking to recruit, or go to their communities and start providing value, before having authentic, in-person conversations about why their involvement is critical. Ask partnering or neighbouring organizations who have more diversity within their organization about their strategies for board recruitment. You should also be open about your organization’s current level of diversity when recruiting. Communicating that your current hiring policies are part of an ongoing initiative to be more diverse will help reassure candidates that they’re not just going to be a token. Include a statement of inclusivity on your next job post or board posting — and make sure you mean it. Plus, remember that giving requirements can be a barrier for some groups. If you’re primarily serving lower-income demographics, or want them to be represented, you’ll need to be aware of this (and consider scrapping it). 4. Make diversity a part of your mission — not just your mission statement. If you find the people who are drawn to your organization are homogenous, it’s time to consider whether something about your message isn’t accessible or resonant for a more diverse population. An explicit commitment to diversity made readily available on your website and materials (particularly anything related to hiring) could help attract those you are looking for. Amending your bylaws to state that a certain percentage of your board must come from the population you serve can also help reinforce your commitment. This suggests a commitment to action, rather than just giving lip service to the idea of diversity. Read the policies above as well as your own to see how you can work on them to be more inclusive and reflect your pledge to diversity. Your members know better than anyone the challenges they face, and who’s best equipped to handle them. That’s why Lauren suggests asking those served by your nonprofit who they might recommend as board members. In her case, teachers voiced a desire for more educational policy and state-level stakeholders to join the conversation. These members not only added diversity to the board, but actually attracted more teachers to join the association because they were excited to hear them speak at the annual summit. This is also important if the population you serve is more diverse than your board. If they don’t feel represented, or if the services you’re offering aren’t tailored to their needs, they may not be getting as much value from your nonprofit as they could otherwise. Send out a quick survey to members you know are engaged with your organization, or ask the next few people to pop through your door, if they know anyone who might be a good fit to join your board. A commitment to diversity requires sustained action within your whole organization, not quick fixes or superficial recruitment. Recruiting a diverse board is only worthwhile if you have an inclusive organization climate, as some individuals will otherwise feel uncomfortable once they arrive. This will mean you can ultimately find and retain the type of board members who will help push your organization into innovative directions and bolster success in the years to come.